With its bright, yellow walls, vintage linens and friendly faces, Sunnyside Cottage in Santa Rosa feels a lot like a welcoming kitchen on a sunny morning. Inside, visitors are greeted not with toast and jam, but with a wide selection of gift items ranging from classic toys to jewelry to retro home decor. 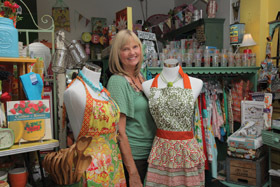 “I want people to feel happy while they shop here and for it to bring back good memories for them,” says Debbie McCormick, who fulfilled a dream when she opened the shop in 2004.